The Oddbods are back in full 22 min episodes! In this slaptstick comedy series, seven colorful little characters join forces to make sure you laugh out loud! The ‘Oddbods’ are a contemporary take on classic comedic performances such as Laurel & Hardy, Charlie Chaplin, the Three Stooges and Buster Keaton. The non-dialogue format allows the series to reach out and resonate with a global audience, due to its culturally neutral, language-less nature! The epic duel between Zig the Hyena and Sharko the Shark is far from over. 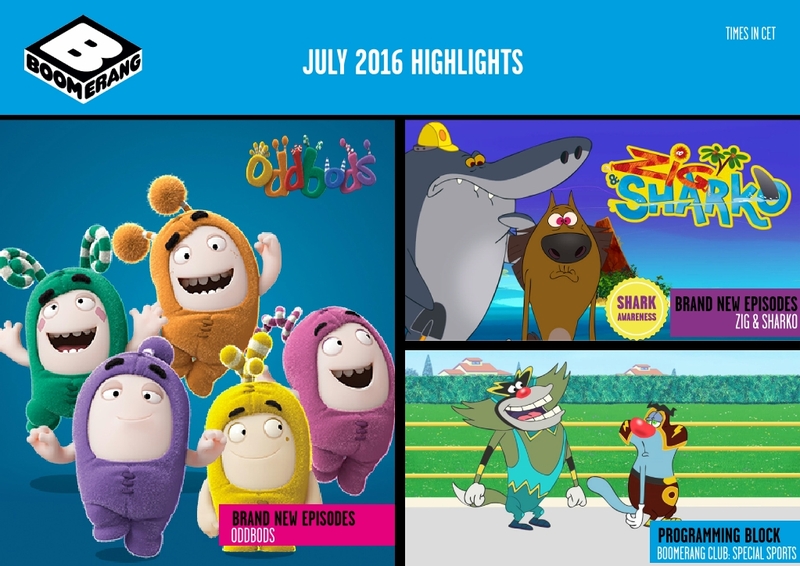 In the spirit of Shark Awareness Day, Boomerang has decided to air the next two new episodes of Zig and Sharko on Thursday 14th of July, on DStv channel 302. Prepare yourselves for more hilarious confrontations between two unlikely rivals over the affection of Marina, the mermaid of the lagoon, in two, all new episodes, premiering exclusively on Boomerang, DStv Channel 302. Sharko may be strong and brave, but Zig has many tricks up his sleeve. Will he finally manage to reach her? Tune in to find out! The Olympic Games is fast approaching and in eager anticipation all the Boomerang characters area and ready to compete! Watch as your favourite Boomerang characters lace up their sneakers and slip on their sweatbands as they get ready for action. Join Tom & Jerry, Wabbit, Mr Bean, The Pink Panther, as well as Oggy and the Cockroaches in sports-focused episodes while the world eagerly anticipates one of the world’s biggest sporting events. To make things even more exciting, Boomerang will also be hosting an all exclusive, cool new sports competition on www.boomeranghq.net. All Boomerang fans will be able to compete by using all their favourite Boomerang characters to compete against each other to be crowned Boomerang’s very own gold medallist.